PLESETSK, Russia, June 25, 2014 (Khrunichev PR) – Today the first integrated launch vehicle of the Angara-1.2 family was transferred to the launch complex at the MoD State Testing Cosmodrome (Plesetsk Cosmodrome) in the Archangelsk Region. 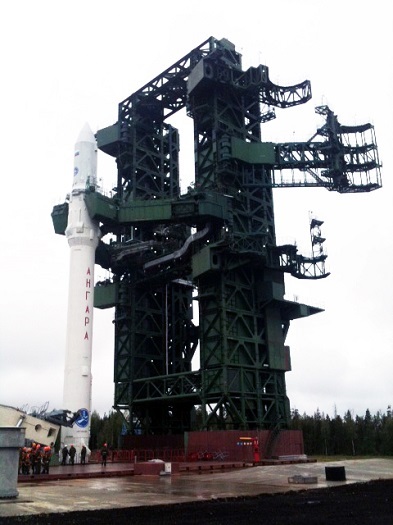 Angara-1.2ML (“Maiden Launch”) was installed on the launch pad. The go-ahead for the roll-out was given by the State Commission for Flight Testing of Spacecraft Launch Systems at its meeting on Tuesday, June 24. 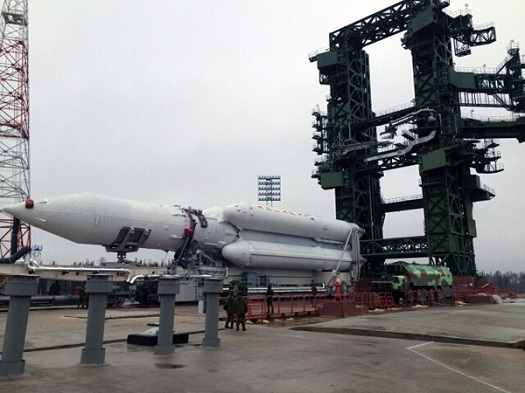 The launch of the light-lift Angara-1.2ML is scheduled for June 27 and begins the flight tests of launch vehicles belonging to the latest Russian space rocket complex, Angara. The purpose of the Angara-1.2ML launch is injecting Stage 2 and a mass/dimensional dummy payload, the latter not to be separated, to a ballistic trajectory. The stack is subsequently expected to reach its targeted impact area in the Kamchatka Peninsula. A look ahead to the coming year in space finds the introduction of new launch vehicles in the United States and Russia and a third attempt to launch a Russian-Korean rocket from South Korea. Meanwhile, China will send another crew to its orbiting space station and a rover to the moon. South Korea once again aborted the planned launch of the KSLV-1 rocket due to a problem with the domestically-built upper stage, according to media reports. This will likely delay the launch into next year. The Korea Aerospace Research Institute (KARI) said that it will determine the next launch date after a thorough inspection of the KSLV-1, but it is unlikely that the liftoff will take place this year as the current launch deadline is scheduled to end on Dec. 5. Engineers say it will take at least four to five days to figure out what went wrong and fix it. South Korea could attempt a launch of the delayed Naro-1 (KSLV-1) rocket on November 29 after a replacement part for the launch vehicle’s Russian supplied first stage was delivered to the Naro Launch Center, ITAR-TASS reports. The replacement part, which is a rubber seal in the connector between the Russian-build first-stage rocket of Naro-1 and the launch pad, was delivered to South Korea on Saturday and is already at the Naro space complex in the south of the Korean Peninsula (480 km south of Seoul). Engineers later confirmed the damage to the seal had been caused by what they called a “gap” between the seal and the connector’s steel component, forcing them to replace not only the damaged seal, but also the defective part of the connector. Engineers will replace the defective part and within several days will complete the check of the rocket’s systems. The damaged seal forced officials to scrub a planned launch on Oct. 26. The first stage is built by the Russian company Khrunichev. This is the third and final attempt to launch the rocket, which is fitted with a South Korean-built second stage and a research satellite. The first two launch attempts failed. Korea will make its third and last attempt to launch a homegrown space rocket between Oct. 26 and 31 depending on the weather. 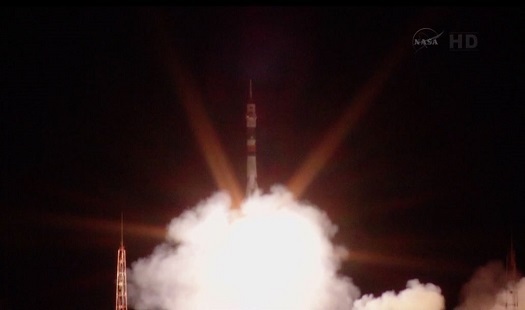 The launch comes two years and four months after the second one failed on June 10, 2010…. The rocket will be taken to the launch pad on Oct. 24. The space center will conduct a final rehearsal the following day and make a final decision at 11 p.m. the same day when and whether to launch the rocket…. Moscow, August 22, 2012 (Khrunichev PR) — The Khrunichev Space Center have completed fabrication and tests of Stage 1 for KSLV-1 (Korea Space Launch Vehicle #1), and processed the flight article for shipment to South Korea. Earlier today, the manufacturer has started transfer of the shipping container with Stage 1 onto a rail convoy to ship this stage to the City of Ulyanovsk within the next few days. From Ulyanovsk, the cargo will be flown by the Polyot air carrier to the South Korean city/port of Pusan to be then re-directed to the Naro Space Center. 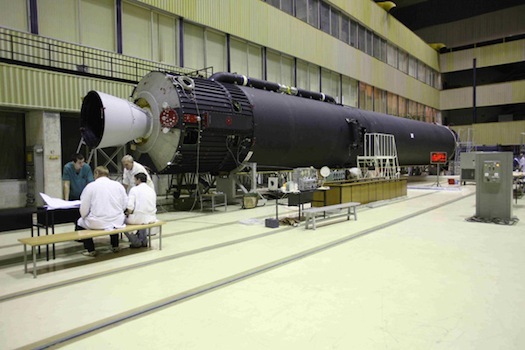 MOSCOW (Khrunichev PR) — At the State Research and Production Space Center Khrunichev, bench tests are being conducted on the first stage of the light-class KSLV-1 rocket. After completing the tests the company’s specialists will prepare the product for shipment to South Korea’s space center Naro where the rocket KSLV-1 will undergo pre-launch preparations. The shipment of the rocket to South Korea is scheduled for August 2012. The third launch of KSLV-1 from the launch pad at the National Space Centre Naro is scheduled for the fourth quarter of this year. 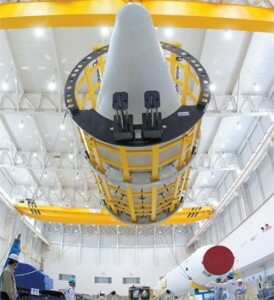 MOSCOW (Khrunichev PR) —In the Khrunichev Space Center are close to completing work on the creation of the first stage for the South Korean rocket KSLV-light class 1. In July, scheduled for the test stage to control the test stand of the plant, and in August to implement sending the product to South Korea. The third launch of KSLV-1 launch pad with the National Space Centre “Naro” is scheduled for the fourth quarter of this year. Cooperation of South Korea and Russia in the field of missile technology has been going on for eight years. 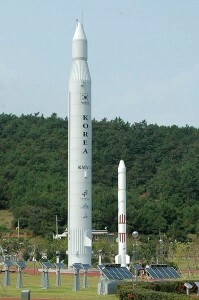 In 2004 a contract was signed for the Korean Aerospace Research Institute (KARI) for the development and creation of space rocket with a booster light class KSLV. Editor’s Note: Both parties are hoping that the third time will be a charm. The first launch failed after the payload shroud didn’t jettison. The second launch vehicle exploded, for reasons that the Russians and Koreans could not agree upon. There is a dispute over whether the Russian first stage or the Korean second stage was at fault. The Russian stage is powered by a scaled-down version of the engine that will be used in the new Angara rocket, which is set to make its debut in the second quarter of 2013. 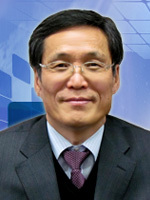 JAXA has posted a Q&A with Seung-Jo Kim, President of the Korea Aerospace Research Institute (KARI). Most of the interview relates to growing cooperation between KARI and JAXA, but there is a good overview of South Korea’s plans in rocketry, ISS experiments and lunar exploration for the next decade. Key excerpts from the conversation follow. “Korea’s space policy is part of the Basic Space Development Promotion Plan, which was based on the Basic Space Development Promotion Act, enacted in 2005. In particular, we emphasize the development of a purely domestic satellite launch rocket called KSLV-2. Our major goal is to launch a domestic satellite on a domestic rocket, making use of the technology and experience gained through the development of the Naro rocket. Russian rocket maker Khrunichev has announced that the third launch attempt of South Korea’s KSLV-1 rocket will take place at the end of 2012. 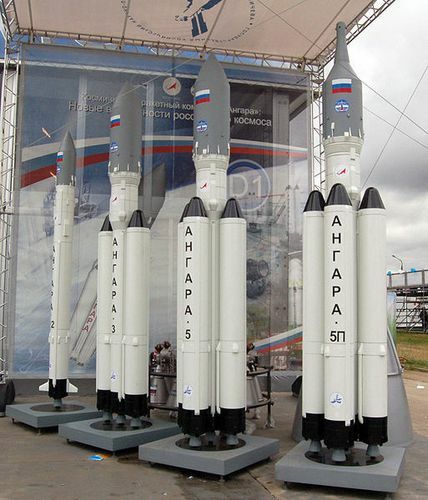 Meanwhile, the first test flight of Russia’s new Angara launch vehicle is due in the second quarter of next year. South Korean and Russian engineers remain at odds over what caused the Naro-1 rocket to fail just 137 seconds after liftoff on June 10, 2010, according to an Oct. 20 report from the Yonhap news agency. The booster, which includes a Russian first stage and South Korean second stage, lifted off safely from the Naro Space Center but failed in flight. South Korea and Russia failed to agree on the cause of last year’s aborted launch of a jointly built space rocket, only offering recommendations that will help prevent all possible causes cited by both sides, the South Korean government said Thursday. An earlier Naro-1 launch failed in August 2009. Both stages worked well, but the fairing protecting the South Korean satellite failed to separate. The satellite and fairing fell into the ocean. 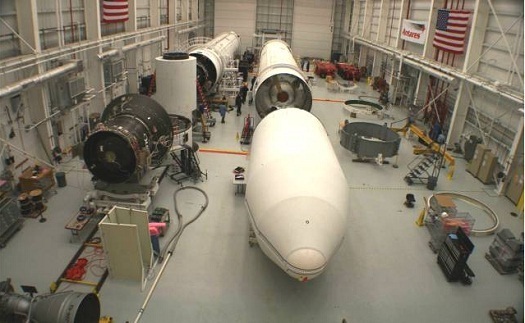 A third test launch is tentatively planned for next year. Editor’s Note: Story updated on Oct. 28 to reflect more recent news. Link to full story also fixed. The Korea Times has a story about the stalemate between KARI and Russiaâ€™s Khrunichev State Research and Production Space Center over a possible third launch of the KSLV-1 (Naro-1) rocket, which has failed in its only two launch attempts.